Deidre and JG delve into the barriers in our brains that prevent us from achieving what we want. So many of us struggle with decision making. Our egos and blind spots are the two biggest barriers in our brains that make it difficult for us to objectively see what’s true, and if you can’t see what’s true, how can you make a good decision? Deidre and JG discuss some of the ideas from Ray Dalio’s book, Principles and how we can all be more radically open-minded! Another topic they cover is the Johari window. The Johari window is broken into four quadrants that show people how they see themselves and how others see them. Open Area: This is the information we know about ourselves and information that others also know about us. Hidden Area: This is information we know about ourselves, but we don’t want to share with others. Blind Spot: This information is known to others, but is not known to ourselves. Unknown Area: This information is unknown to us and to others. Beware the big ego. Our ego barrier, as described in Ray Dalio’s book, Principles, is our subliminal defense mechanism, it makes it hard for us to accept our weaknesses and mistakes, and holds our deep seeded needs and fears. Be radically open-minded. Recognize that you don’t know what you don’t know and what you can learn from others. Decision making is a two-step process. Radically open your mind and sincerely believe that you might not know the best possible path. First get all of your information and then make your decision. Watch out for the close-minded. Close-minded people don’t want their ideas challenged, have big egos, are not usually very humble, and are more likely to make statements instead of asking questions. 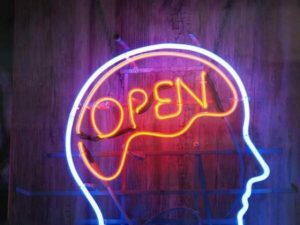 LISTENERS: Are you open-minded? Share your experiences and “wiZdoms” with us! Either leave us a voicemail at 1-646-653-9278 or send us an email. We may talk about it - or we may even talk with YOU - on the air!